Experts say that throngs of cruise ships tourists are in danger of degrading the quality of Santorini holidays for all. But solutions exist. Santorini’s limits are being tested by the arrival on the popular southeast Aegean holiday island of thousands of tourists every day, even in the fall. Moreover, although it has the second highest number of cruise visitors after the country’s biggest port, Piraeus, Santorini sees the least economic benefits from this activity, which additionally puts a strain on its infrastructure, the local community and also on other visitors, particularly hotel guests. 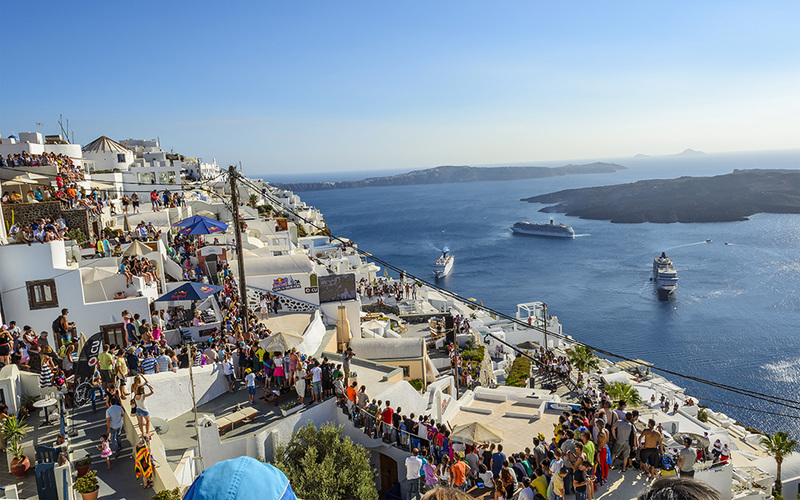 The problem – which is all too evident as one walks along the crowded streets of Oia and Fira – meanwhile, is only set to get worse as cruise operators are looking to introduce overnight stays. 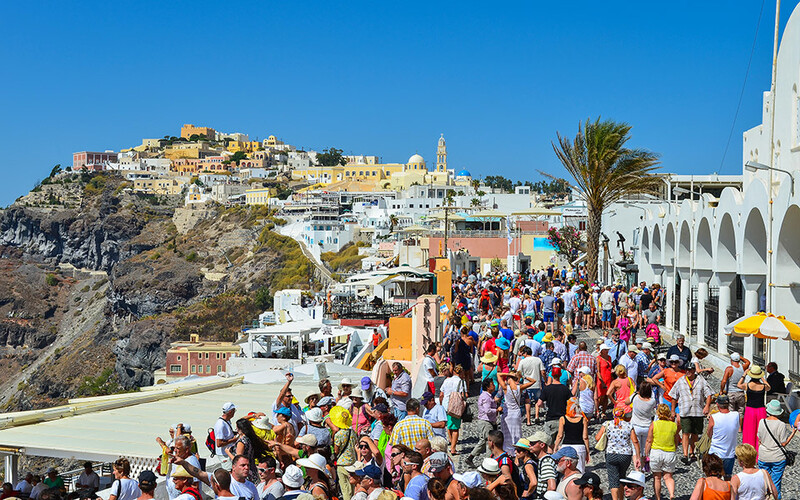 It is estimated that more than 12,000 passengers disembark from cruise ships onto this island of 15,500 people every day during the summer season, the overwhelming majority of whom will visit the two traditional villages of Oia (population around 1,500) and Fira (about 2,100). There are days when you’ll see as many as six big liners idling in the caldera because there is nowhere for them to berth. From there they ferry their passengers to and from the island on small pleasure boats. Added to them are some 2,000 daily visitors from Crete, who mainly travel to Santorini on the two high-speed ferries that service the route, but also thousands of others already staying at the island’s hotels and rooms to let. As many as six cruise ships can arrive in Santorini on one day. The problem of overcrowding was evident even in the last couple of months, as dozens of tour buses struggled to maneuver and park in the narrow streets of Oia and Fira – arguably two of the prettiest villages in the world – their drivers likely praying that they wouldn’t be too late for their passengers to catch the famous sunset. Tourism professionals put the number of buses and minivans used to shuttle tourists around the islands in the hundreds, with some estimates as high as 1,000 vehicles. What is the contribution of so many thousands of visitors to Santorini, though? Do they actually boost the island economy and employment? Is this overcrowding destructive, a hassle for visitors who have paid thousands of euros to visit one of the world’s most beautiful islands only to have to jostle for a sunset snapshot? And how will this affect the island’s long-term appeal? These and other such questions have been explored by the University of the Aegean and Dianeosis, an independent research organization renowned for its reliable and in-depth studies – and both warn of the serious dangers of allowing this situation to continue. Fira and Oia in particular bear the brunt of the crowds. The university has rung the alarm bells over the rate of construction, noting that Santorini had 13,528 houses in 2011 from 3,755 in 1971. It stresses the problems of water supply, waste treatment and garbage management, saying that the island’s existing infrastructure will soon be unable to cope if the rate of arrivals continues as is. It also stresses the problems with traffic circulation, noise pollution and energy needs, not to mention the environmental pollution caused by so many cruise ships and tour buses. The benefits, meanwhile, appear small in comparison. According to official data from the Greek Port Association, Santorini received 783,893 cruise visitors in 2016. Bank of Greece figures, meanwhile, show that the contribution of cruise tourism to the economy that same year came to 509 million euros, with Piraeus benefiting at a rate of 43.8 percent, Corfu 14.7 percent and Santorini just 8.6 percent. So, of the 509 million euros that came into Greece from cruise visitors, the southeast Aegean island got just 43.7 million euros. Divide that figure by the number of passengers, however, and you get an average per capita expenditure of 55.8 euros, against the nationwide average of 97.9 euros per passenger. 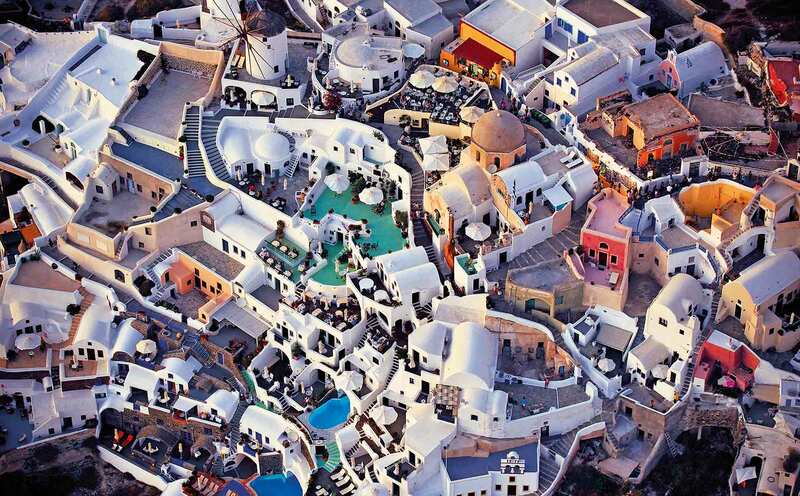 It is estimated that Santorini has around 60,000 beds, 12,500 of which are at hotels, 23,000 at rooms and apartments to let, and the remainder at rented holiday homes. Annually, the island now receives 1.3 million visitors by air and sea who spend a total of 5 million nights. This is almost double the 750,000 arrivals and 3.3 million overnight stays of 2012. According to the Foundation for Economic and Industrial Research (IOBE), meanwhile, domestic air arrivals have shot up by 168.9 percent from 2009 to 2016 and ferry passenger arrivals by 31 percent. The 780,000 to 900,000 annual cruise passengers come on top of all this, straining resources and downgrading the tourism product to the detriment of themselves and others. Plans to restrict the daily number of cruise passenger arrivals to 8,000 from 12,000 today, however, appear to be nothing less than a pipe dream, as cruise operators are starting to examine offering overnight stays, which will only increase the pressure on the island even more. There is one obvious solution to the problem: fewer visitors with higher per capita expenditure. Instead of introducing measures in this direction, however, authorities are limiting themselves to merely managing the circulation of visitors and arrivals of large cruise ships instead of learning from other popular destinations that have faced a similar problem. Dianeosis points to Venice, where, under pressure from residents fed up with huge liners marring the view of their beautiful port for limited gains, the municipal council prohibited ships over a certain size from using the city’s port. This prompted professionals and officials in the Italian city as well as in the cruise industry to develop a higher-quality product that may have resulted in lower visitor numbers, but also brought bigger-spending tourists and contained the escalation in arrivals to more sustainable levels. The organization’s report also mentions the French Riviera ports of Nice and Cannes, where a limit on cruise arrivals is combined with adequate accommodation and services thanks to effective practices managing berthings and balancing the distribution of passengers/ships per day. 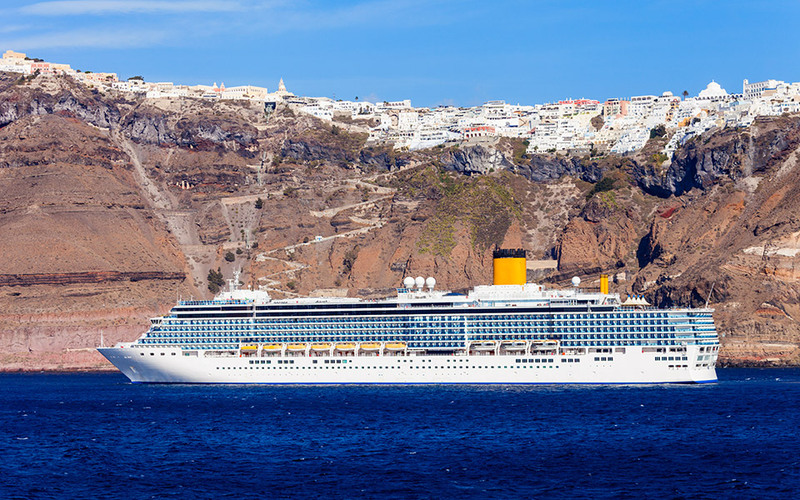 “This is in contrast to Santorini, where cruise ships come in all at once on specific days of the week and port and land cruise services infrastructure remains inadequate,” Dianeosis notes. Santorini may be the most extreme case, but the problem of excessive cruise traffic is evident in many other parts of the country as well, as Greece is the third most popular Mediterranean cruise destination, but enjoys limited benefits from this reputation. “Greece needs to intensify efforts to promote new destinations, beyond Santorini and Mykonos. For us, the global recognizability of Santorini and Mykonos, which are amazing destinations of course, makes it very difficult to promote cruises on which they are not included. Yet we know that Greece has many other top destinations that deserve to be promoted,” says Michel Nestour, vice president of global port and destination development at Carnival Corporation.